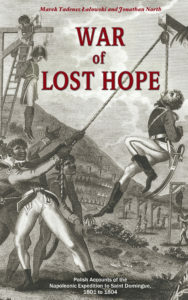 This collection of four Polish memoirs about the expedition to Saint Domingue has now been published on Amazon. It presents the recollections of four officers who survived the destruction of Napoleon’s expeditionary force, setting the accounts in context and outlining the fate of the Polish contingent sent to the West Indies. This has been published in Kindle format but a paperback will be made available shortly. I recently gave a talk on a particular aspect of the expedition: Polish deserters in Haiti. This took place on 19 May at the London Socialist Historians’ Workshop. My talk is given here.